Bratislava is fast (just one hour) and cheap ($20 dollars) to get to from Vienna. It's easy to navigate, full of old world charm, colorful buildings, and great inexpensive restaurants and cafes serving regional specialities at half the cost of Vienna. American Journalist based in Japan. Bratislava has that distinct feel of an Austro-Hungarian empire-era city. Bratislava is fast (just one hour) and cheap ($20 dollars) to get to from Vienna. It's easy to navigate, full of old world charm, colorful buildings, and great inexpensive restaurants and cafes serving regional specialities at half the cost of Vienna. The historic district has that distinct eastern feel of an Austro-Hungarian empire-era city. When Slovakia and the Czech Republic split, the Czech's took Prague, Slovakia got Bratislava. Slovakia's capitol city -- and the former capitol of the Kingdom of Hungary -- is no Prague, but it is a great day out with enough to do and see and still get you back to Vienna in time for cocktails. Just forget that the city's name sounds like a workingman's sandwich on thick brown bread, okay? It's much more than that. 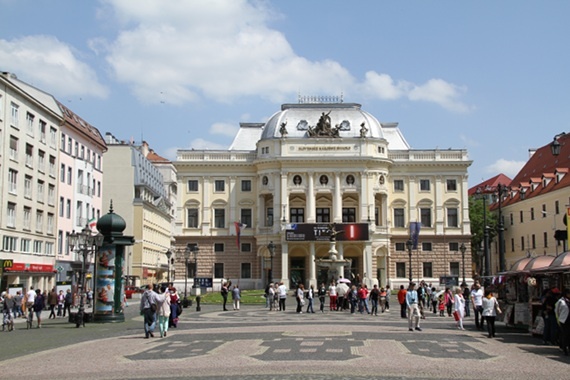 The Slovak National Theater. Photo courtesy Shu Nakada. Bratislava is a short 38 miles from Vienna by train The old town is a pedestrian-only zone where the one vehicle allowed is a tiny, bright red retro tourist train just able to navigate the narrow side streets. 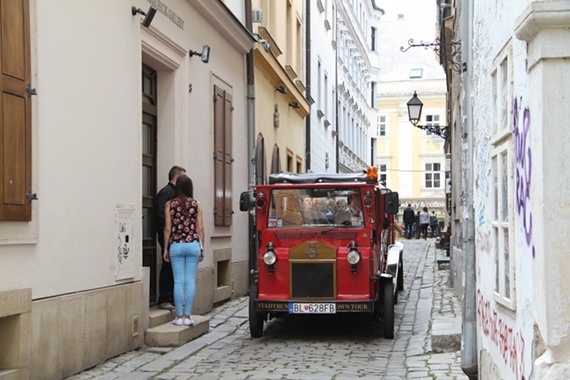 The tiny retro tour bus squeezes through the narrow streets of the old town. The Danube, which is a turgid brown, not Strauss blue, flows right through Bratislava. Shiny, high-rise apartments, hotels, a riverside promenade and a massive shopping mall are located in the new developments along the banks. But that's not what you've come to see. 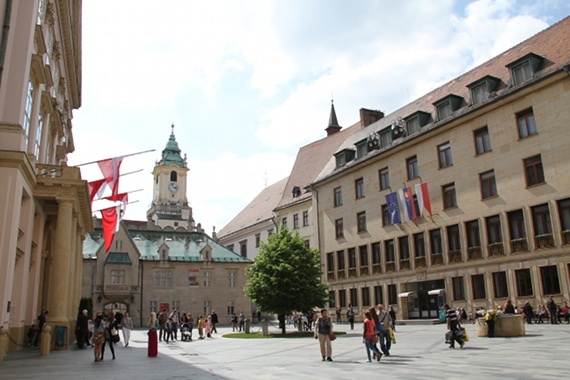 The old district is anchored by the beautiful neo-Renaissance style Slovak National Theater and Primatial Palace at one end, and the Renaissance and Baroque style Town Hall and wide main square at the other. In between is popular St. Michael's Street leading to St. Michael's Gate and its 51 meter tower. The gate is the last of the city's medieval fortifications and one of Bratislava's most famous tourist destinations. Visitors climb to the viewing platform for a birds-eye look at the old town. St. Michael's Street is full of shops, cafes, and restaurants. Although the tourist pamphlets talk about the shops and eateries along St. Michael's Street, the entire old town is full of tasty places for a full meal, a cold beer, or sweets and coffee. Prices are very reasonable, especially compared to Vienna. The cafes in the Main Square, like Cafe Doge, are great for people watching. Particularly around the statue of Napoleon. All this could have been mine....except the stroller. I don't need that. Napoleon attacked Bratislava in 1809. There's still a cannonball in one window of the Town Hall. 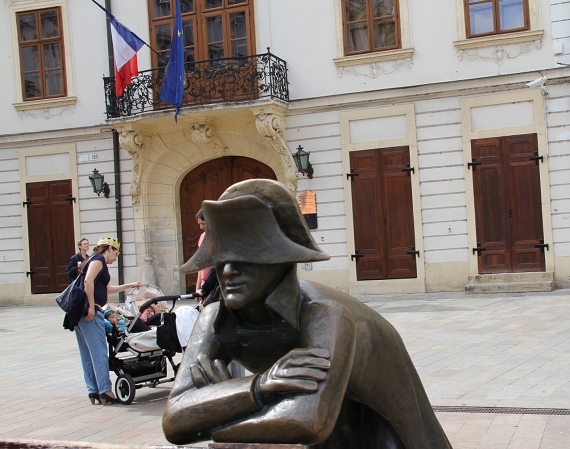 A modern bronze statue of the Emperor leaning on a bench while he contemplates the comings and goings in the square is a favorite prop for photos. Gothic-style St. Martin's Cathedral. Eleven Hungarian Kings and Queens were crowned here. Photo courtesy Shu Nakada. 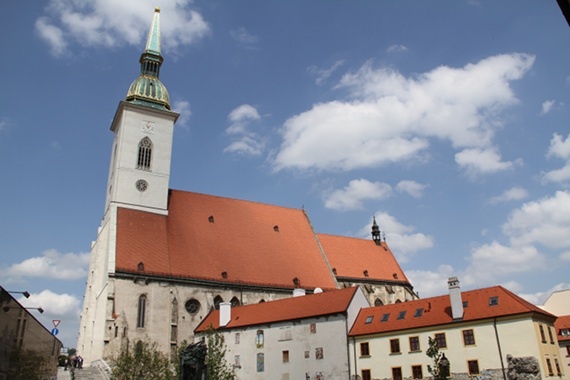 A few blocks away from the old district, and on the other side of St. Martin's Cathedral, is Bratislava Castle. Historically, this hill was a very important piece of ground. Since the Bronze Age, Celts, Romans, Slavs and Hungarians have built a succession of fortifications here. The current building is modern. Fire in the 1800s. It happens. 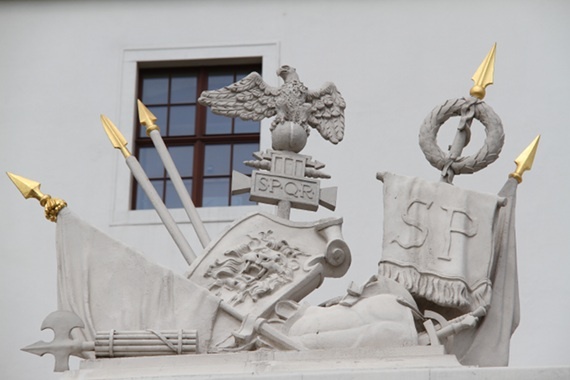 The Romans were one of many empires that occupied Bratislava Castle hill. Climb to the castle if you're interested in visiting the Slovakia museum there or because you really like climbing stairs. (Lots and lots of stairs...) The view from the ramparts is vast. Unfortunately what that vastness encompasses is a lot of dreary gray tower blocks and factories and the modern Novy Most (new bridge) spanning the Danube. If time or energy is limited, you can skip the trek and enjoy the vista from St. Michael's Tower. Open 9-5, Tuesday through Sunday. 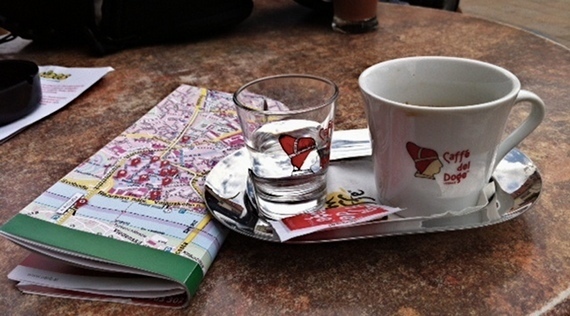 Make the most of the relaxed pace of this city at one of the cafes in the main square. 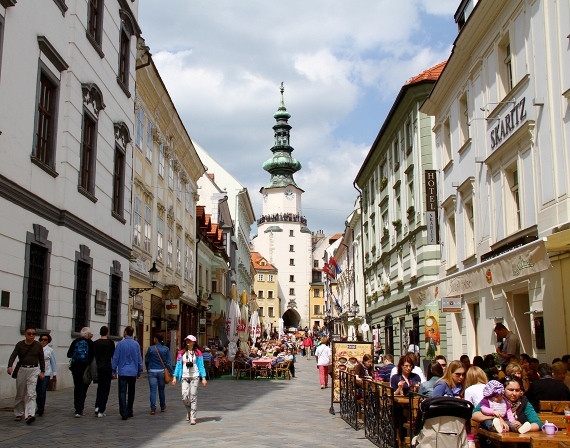 The real charm of Bratislava is wandering around the old town, enjoying the picturesque views and relaxing on the way with good food and drink. The pace of this little city is relaxed and unhurried and one of the reasons I think it makes such a perfect day out. You get back to Vienna feeling like you really been somewhere but not so exhausted you can barely put one foot in front of the other. Unless you climbed to the peak of Bratislava Castle hill. Then, I make no guarantees. Getting there: Unless you already have a Eurail pass, the best deal is the excursion fare from Vienna. The 'Bratislava Ticket' is 15 euros round-trip for an adult including a one-day pass for Bratislava transportation. Go to any OBB ticket office in Vienna. (I usually stop at the one on the ground floor in Wien Mitte). Trains depart Vienna Hauptbanhof Station almost every hour starting just before 6 a.m. with the last train a little after 10 p.m. Return trains also leave every hour from Bratislava Halva Stancia (central station). It takes about an hour to get there. Out of Vienna, the ticket is valid for your return four days from date of purchase, in case you want to roam further afield. Here's the OBB Austrian Rail travel website. Like many Eastern European train stations, Bratislava Halva Stancia station is short on charm. Get off at the third stop, Namestie SNP, for the pedestrian zone. It's just a few minutes walk into the old district from here. Bear to your right across the square. When you're ready to return, pick up the X13 again on the other side of the busy street. 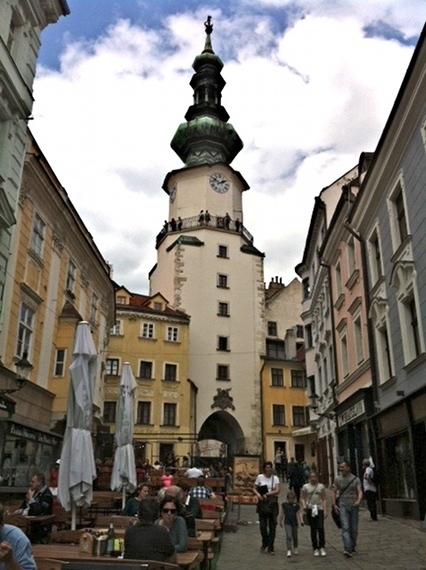 One of the splendid town squares in the pedestrian zone. If you are not on the Bratislava excursion ticket, you will have to buy your city bus ticket at one of the kiosks. Tickets are not available on the bus. Machines take up to 2 euro coins only. No bills. A15-minute, one-journey-only ticket is .70 euros (about one dollar). That's probably all you need. A 60 minute transfer ticket is .90 euros (US$1.80). That means once validated, it is only good for one hour, not all day, get it? Stamp your ticket in the automatic validating machine once you board. Bus inspectors are vigilant! Do not ruin your inexpensive day out with a high-priced ticket penalty. Just in case you really, really want to go to a big shopping mall and eat in an eastern european food court, the X13 bus ends up down by the river. Just stay on a few more stops past the old district until you see the mall and hotels. Little red "Oldtimer" tourist bus: Your one-day transport pass does not include a ride on the tour bus. That costs extra. 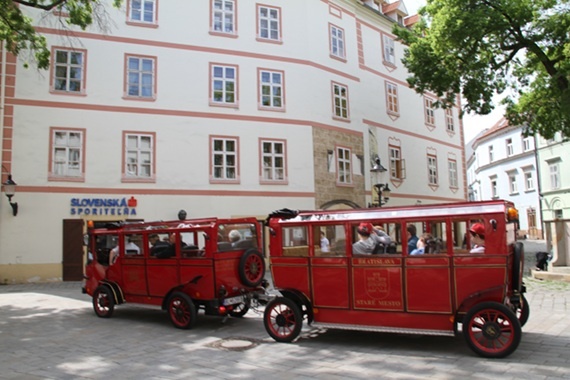 These buses run thirty- and sixty-minute tours of the old town or up to the castle - saving you the walk. The pre-recorded tour is available in a number of languages. An hour tour is around ten euros. If your party has limited mobility, this is an easy way to see the sites. This is their website, there's very little information on it and, sorry, no prices.